The Church of the New Testament was built by Jesus Christ; for, in Matthew 16:18 Jesus said, "...and upon this rock I will build my church. . . '' Not only is he its founder, but also its head. The apostle Paul stated this clearly when he wrote "and he put all things in subjection under his feet, and gave him to be the head over all things to the church" (Ephesians 1:22). As founder and head he is also our pattern for living as members of his church, "For hereunto were ye called: because Christ also suffered for you, leaving you an example, that ye should follow his steps" (1 Peter 2:21). Regarding our subject in this chapter we then ask, "What example did Jesus leave as to what kind of attitude we should have toward those who are in physical need?" We should also ask, "What commands or examples has he given to his church today in the New Testament concerning benevolence?" In the writings of Matthew, Mark, Luke, and John which describe the life of Christ before he built his church, we discover him to be a person of great compassion. His greatest concern was of course with the sins and souls of the people, but while living among men he demonstrated his care and concern for the physical needs of the people as well. A good example of this was when his friend Lazarus died. When he went to the home of Mary and Martha and saw their sorrow and that of their friends the scriptures tell us, ". . . he groaned in the spirit, and was troubled. . . Jesus wept. . . he loved him" (John 11:33-36). There are many instances in Christ's life which demonstrate to us that to be like Jesus or to be Christ-like we will need to be concerned about the physical welfare of others. Many came to Jesus for care. Jesus was moved with compassion because of their great needs: "But when he saw the multitudes, he was moved with compassion for them, because they were distressed. . . " (Matt. 9:36). He was concerned that people were hungry: "I have compassion on the multitude, because they continue with me now three days, and have nothing to eat" (Mark 8:2). Jesus then provided food for the people. Not only did Jesus show his compassion for others in need but he also taught great lessons on the subject. Perhaps the best known is the story of the good Samaritan (Luke 10:25-37). Jesus emphasized that the greatest commandment is to love God with all our heart, soul and strength, and the second greatest commandment is like it, to love our neighbor as we love ourselves. When a man in the crowd asked, "Who is my neighbor?" Jesus responded with the story of the Good Samaritan. The story is about a man who gave his time, energies, and money to help a stranger in need. The stranger had been beaten and robbed and was in need of medical attention, food, and a place to stay. He provided it all and as a result he received the praise of Jesus for his act of compassion. Jesus then told the man in the crowd, "Go, and do thou likewise." But when the Son of man shall come in his glory: and before him shall be gathered all the nations: and he shall separate them one from another, as the shepherd separateth the sheep from the goats; and he shall set the sheep on his right hand, but the goats on the left. Then shall the king say unto them on his right hand, come, ye blessed of my Father, inherit the kingdom prepared for you from the foundation of the world: for I was hungry, and ye have me to eat; I was thirsty, and ye gave me drink; I was a stranger, and ye took me in; naked, and ye clothed me; I was sick, and ye visited me; I was in prison, and ye came unto me. Then shall the righteous answer him saying, Lord, when saw we thee hungry, and fed thee? or a thirst, and gave thee drink? And when saw we thee a stranger, and took thee in? or naked, and clothed thee? And when saw we thee sick, or in prison, and came unto thee? And the King shall answer and say unto them, Verily I say unto you, Inasmuch as ye did it unto one of these my brethren, even these least, ye did it unto me. Jesus continues to describe the scene by saying that those who did not render this service to others would go away into eternal punishment, but those who did render the service would go away into eternal life (Matt. 25:31-40, 46). We would note that in each of the above cases not only were friends or brethren to be helped, but the stranger as well. These are the exact instructions that are given to Christians in the New Testament church, "Let love of the brethren continue. Forget not to show love unto strangers. . . " (Hebrews 13:1,2). The apostle Paul wrote to several congregations and instructed them with these words: "So then, as we have opportunity, let us work that which is good toward all men, and especially toward them that are of the household of faith" (Galatians 6:10). The church's responsibility of helping the needy is not, therefore, limited to its own people. WHAT METHODS ARE TO BE USED? The Scriptures give us the command and responsibility of helping others but they do not tell us in any detail how to do it. Each autonomous congregation and individual has been left to decide upon their own, how the needs of the needy are to be met. The examples that we have are few. In Acts chapter six we find that some of the widows were being neglected. The apostles' answer to the problem was to appoint several men to oversee the work of seeing to it that their needs were met. This would be one of the responsibilities of deacons in the church today. In 1 Corinthians 16:1-3, and 2 Corinthians chapters eight and nine we have the example of several men taking up a collection from several congregations to help the poor saints in Judea. James wrote that Christians are to care for orphans and widows: "Pure religion and undefiled before our God and Father is this, to visit the fatherless and widows in their affliction, and to keep oneself unspotted from the world" (James 1:27). James, however, does not tell us how the local congregation or the individual is to do this; therefore, it is left up to us to do it in the most expedient way. The most important care that the church and Christians render is the saving and teaching of souls. That is its main business. Even benevolence is a means to that end. But it is difficult for a hungry person to study or learn God's will. The church's responsibility is not to feed and clothe the world but to teach the gospel. Jesus' disciples are, however, to be a compassionate people, just as he was. As God says, ". . . we should remember the poor. . ." (Galatians 2:10). Christ is our example in attitude toward rendering service to others. He taught his disciples to love and have compassion for the unfortunate, and he practiced what he taught. If we are to walk in his footsteps and follow his example, we too must do the same. 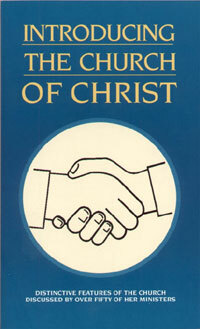 The church is the body of Christ and he is its head. As members of his body Christians must reflect Christ in their lives, or as the apostle Paul says, ". . . so now also Christ shall be magnified in my body, whether by life, or by death. For me to live is Christ, and to die is gain" (Philippians 1:20,21); and, ". . . it is no longer I that live but Christ liveth in me. . . " (Gal. 2:20). In regard to methods of feeding the hungry, clothing the needy, taking care of orphans and widows, little information is given. We are simply told to do it. It must be left up to the decision of the elders of the local congregation just as God intended it. But whatever we do it must be in accordance with the purpose of the church, to reach souls, to teach the gospel, and help its members to grow and mature to be like Christ. What was Christ's attitude toward those in need of food? What great test will be applied on the day of judgment as to whether one is saved or lost? What commands were given to the early church regarding the poor, the widows, the orphans, etc? What methods of caring may the church use today? What is the main purpose of benevolence?